Hong Kong, The Future Now? 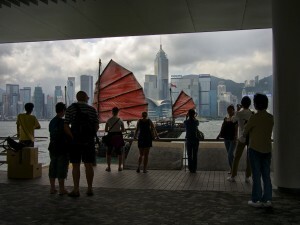 I got the opportunity to return to Hong Kong in September and took it. My first trip there left me feeling similar to how I felt when I first went to NYC; dazed from sensory overload. In both places I was filled with a manic energy that, coupled with jet-lag, was very enervating; a kind of natural high. In the heat and humidity I was running around and always running on empty, but dared not relax lest I missed something. As a consequence, there were a lot of pictures that, though mostly good, now seem unconnected, with no theme, or thread to hang a story on. Where to stay? well I decided to head further north in Kowloon this time and ended up in Mong Kok, which is far less influenced by the ex-pats and suits of say, Tsim Sha Tsui, or The Island. If you think those areas are lively, they are nothing compared to Mong Kok! The sheer mass of people, the riot of colour and neon could be overwhelming. I was fine with it, well, except for one day, when, hung-over, having to venture out into that maelstrom (for my coconut water fix) I wished I was back in sleepy Barcelona. I think HK just about maintains a balance between the glamour and sanitised vision of the ‘future is now’ and the vibrant, visceral patina that comes from so many people huddled into limited space; I personally like my places messy, worn around the edges and well, a little pungent. One day I decided to head toward the Chinese border on a train to check out other towns. I t was pretty depressing. Sure the rain didn’t help, but in truth the unremitting shabbiness of bad intensive housing and nothing historical that I could see, left me feeling like my soul had been gutted and then probably sold to some rich guy across the border. It was pretty bleak and I was happy to get back to the lurid mania of Kowloon; it has a certain charm and benefits from being a melting pot wherein nothing has completely melted.